But currently, Metal is limited to Apple’s A7 processors (iPhone 5S) under the new iOS 8. 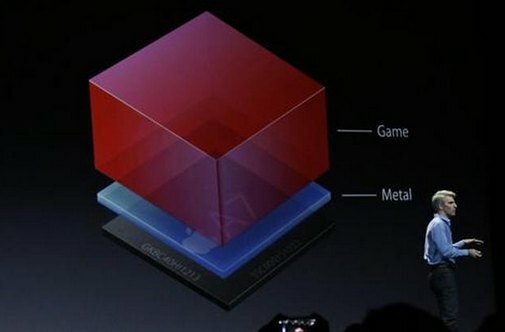 According to Apple, Metal allows to get 10x faster draw rates than OpenGL. Metal offers a more direct access to the CPU and GPU. Metal seems to follow the new rule in 3D programming launched by AMD with Mantle. I hope we’ll see Metal on OS X (desktop GPUs) in not too distant future! Metal is a low-overhead framework for managing, committing, and executing both graphics and compute operations. Metal is designed to eliminate “hidden” performance bottlenecks such as implicit state validation. You get control over the asynchronous behavior of the GPU. You can use multithreading efficiently to create and commit command buffers in parallel. The Metal shading language is a unified programming language for writing both graphics and compute functions that are used by apps written with the Metal framework. The Metal shading language is a C++ based programming language that developers can use to write code that is executed on the GPU for graphics and general-purpose data-parallel computations. Since the Metal shading language is based on C++, developers will find it familiar and easy to use. With the Metal shading language, both graphics and compute programs can be written with a single, unified language, which allows tighter integration between the two. Apple to adopt NVIDIA’s CUDA technology? Is the failure of OpenGL as multi-platform 3D graphics library complete? Perhaps only in the game industry, since just about every cross platform commercial 3D visualization application uses OpenGL and these types of companies move at a snail’s pace when it comes to adopting new technologies. But let’s not forget all android games are still OpenGL ES, and unless Apple implements an OSX Metal driver, which may or may not be likely depending on whether the programming paradigms fit Intel integrated chipsets, all OSX games and 3D software are still OpenGL. Personally I would like to see other vendors adopt Metal. The API looks very well designed and easier to use. Oh my, so I guess they’ll sue S3 for having MeTaL before Apple 😉 Yup. And it was too vendor-specific 3D API. 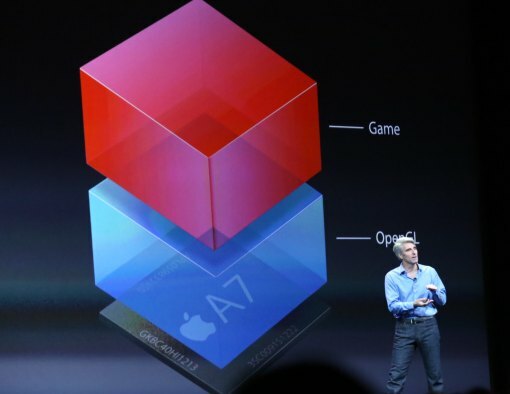 AMD comes with Mantle, Apple with Metal, who’s next? Intel, Google ? Wow, it the API I would like to have on any platform… It is really clean and performance oriented at the same time. And easy to use! I think that we need now a new OpenGL library such as Metal or Mantle. OpenGL is become too big, too complex and too inefficient. Also as first 3D graphics library is now unsuitable. come on IHVs, you won’t now all create your own API, will you ? I think that’s a good direction. I would prefer light, simple, low-level API per vendor than one huge, complex and very hard to implement OpenGL. To get portability open source community could write higher level library on top of these per vendor APIs. 1) Its not 90’s nowadays everybody and their grandmams can use quality game engines. 7) Khronos/Nvidia/AMD are really, really, really tight lipped about future of such approach. OpenGL/ES need quality (this vary from “just enough” to “way to sluggish”), need good tools (that is actually progressing well), need evangelists (non-existing… 😐 ), and clear plan for the future.